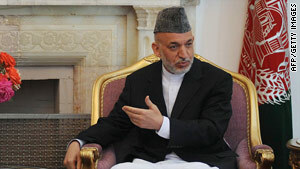 Afghan President Hamid Karzai says investigators should be able to work without political interference. Kabul, Afghanistan (CNN) -- For the first time, Afghan President Hamid Karzai says he is committed to allowing two key government anti-corruption units to operate without political interference. The announcement came after a series of meetings Thursday night and Friday in Kabul with U.S. Sen. John Kerry and other senior U.S. and Afghan officials -- talks that both Kerry and Karzai described as a "candid and productive" conversation. In separate statements after the meeting, both said that Kerry and Karzai agreed on the importance of strengthening the Major Crimes Task Force and the Sensitive Investigative Unit. Both units have been criticized by the Afghan president for allegedly abusing the rights of a top government official arrested on corruption charges. In a visit to Kabul Wednesday, Kerry told Karzai that the issue of corruption is undermining U.S. support for the war. "The president and I agree that the work of these entities must be allowed to continue free from outside interference or political influence, including with respect to ongoing cases," Kerry said. Kerry added that U.S. military contracts, "in some cases, have also created some capacity for misbehavior, and so we all need to look very carefully at the impact of a wartime economy and a lot of money, and make sure that it is accountable and transparent. We're committed to doing that, the president says he is, and we need to work together to make sure that both of us fulfill our obligations." Karzai has been sensitive to what he perceives as U.S. interference with the two units, and in a written statement he stressed that "both sides agreed on ensuring that they would always operate as independent sovereign Afghan entities, run by Afghans, allowed to pursue their mission of enhancing transparency and combating corruption free from foreign interference or political influence." The discussions took place at the president's palace in Kabul. U.S. Ambassador Karl Eikenberry, Afghan National Security Advisor Dr. Rangeen Dadfar Spanta, and Afghan Foreign Minister Dr. Zalmai Rasool took part in the meetings. Other issues covered during the Kabul meetings included the importance of eliminating civilian casualties, improving the delivery of services to build confidence for the Afghan people, and eliminating private security contractors as soon as possible. This week the Afghan president ordered that all international and Afghan private security contractors shut down operations in the country within four months.